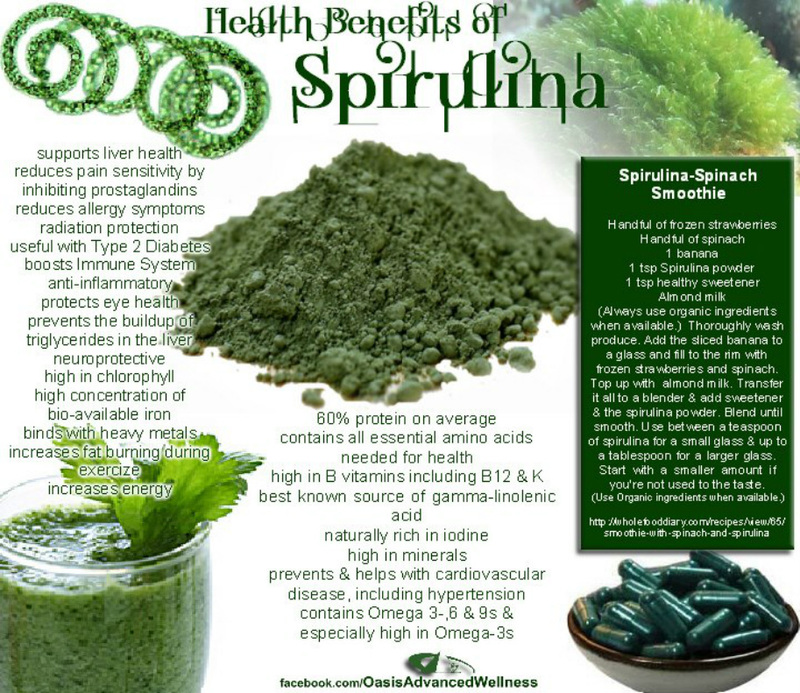 Spirulina - Are You Ready for a Change? The blue-green algae spirulina is sold as a dietary supplement. While few human studies have been done on the effects of spirulina, preliminary research has indicated that it may confer a wide range of potential health benefits when consumed. Found in both fresh water and salt water in the wild, spirulina is also commercially cultivated around the world. At normal consumption levels spirulina is considered safe for most people and can be included as an addition to any healthy eating plan. This truly 'super' food offers health benefits to almost every organ and bodily function. If you're looking for cellular regeneration, accelerated wound repair or faster healing time - spirulina can help. By enriching the immune system, you're less likely to experience colds, flus or other infectious diseases. In this computer age, many people are looking to improve their eye health. Rich in antioxidants, spirulina is 10 times richer than carrots (per gram) in vitamin A - especially good for nourishing the eyes. Today, we view inflammation as an underlying stress in every disease - spirulina happens to be one of the most potent anti-inflammatory agents found in nature. And, finally, a strong digestive system will help to detoxify the body. Spirulina helps to heal leaky gut syndrome and autoimmune diseases. If you're looking for a good source of protein - just 3 grams of high-quality spirulina provides 60% protein, lots of vitamins and minerals plus many phytonutrients for optimal health. Spirulina is high in antioxidants, including carotenoids, vitamin E, phenolic acids and selenium. Antioxidants destroy free radicals that otherwise would wreak havoc within cells as they scavenge electrons from molecules such as DNA. A diet high in antioxidants can help protect the body from heart disease, diabetes, cancer and infection, according to the American Dietetic Association. According to Drugs.com, spirulina can destroy a wide range of viruses and bacteria, including herpes simplex, influenza A, mumps, measles, cytomegalovirus, enterovirus and HIV-1. Spirulina can also stimulate the immune system to produce macrophages, natural killer cells and monocytes. All of these cell types can destroy invading pathogens. Research published in the Indian journal "Vegetos" found that spirulina destroys fungal pathogens as well, including Aspergillus fumigatus, Aspergillus niger and Candida albicans. Candida albicans is the organism responsible for vaginal yeast infections. Spirulina may provide benefits for people with respiratory related diseases, such as asthma and allergic rhinitis. For example, a dose of 1 g of spirulina per day helps improve lung function in people with mild to moderate bronchial asthma, according to a 2001 study in the "Journal of Nutraceutical Functional Medical Foods." Another study, published in 2005 in the "Journal of Medicinal Food" found that spirulina reduced the levels of cytokines in people with allergic rhinitis, an indicator of a reduced autoimmune response. The novel protein C-phycocyanin, which has only been identified in spirulina, may inhibit the release of histamines, compounds that contribute to allergic response. Because spirulina is high in protein and other nutrients, it may be effective as a supplement to help underweight and malnourished individuals increase weight. Spirulina may also help modulate blood sugar in people with type 2 diabetes, reduce certain types of tumors and protect against fatty liver, according to Drugs.com. These uses have not yet been evaluated in human clinical trials, so further study is needed before definitive conclusions can be made about the effectiveness of spirulina for these conditions.